At Lincoln Pipestone Rural Water, our goal is to provide safe, clean, sparkling water to all of our residents. The Lincoln Pipestone Rural Water System has been constantly growing and changing since its beginning in1979. Growth was and continues to be a big part of the change affecting the System, but other issues such as changes in agriculture practices and new environmental regulations have impacted us also. The LPRW Board has taken the position that despite changing conditions it is the System's responsibility to support agricultural producers as they adapt to new production methods, while also extending service to new customers whenever possible. This all needs to be done without affecting service to existing customers. LPRW was legally established under Minnesota Statute 116A in 1979, but planning and organizing started in 1976 when a group of Lincoln County farmers began pursuing the dream of clean and plentiful water. Since its beginning LPRW has grown to provide service in Lac qui Parle, Lincoln, Lyon, Murray, Nobles, Pipestone, Redwood, Rock, Yellow Medicine, and Jackson Counties. LPRW gets its water supply from well fields from three sources near Verdi, Holland and Burr. The LPRW Board has adopted a policy of providing water service whenever it is feasible to do so, and as a result growth and expansion of the System is an on-going process. New water sources are being developed to meet existing needs as well as allowing for future expansion, however long-term potential has not been examined in detail. Given the need to look further into the future, the LPRW Board has decided to begin a long-range planning process aimed at better understanding the future needs and resource requirements of the System. The input of our members, county officials, and our many partners at the federal, state and local levels will be critical to the value of a long-range plan and any projects implemented as a result. 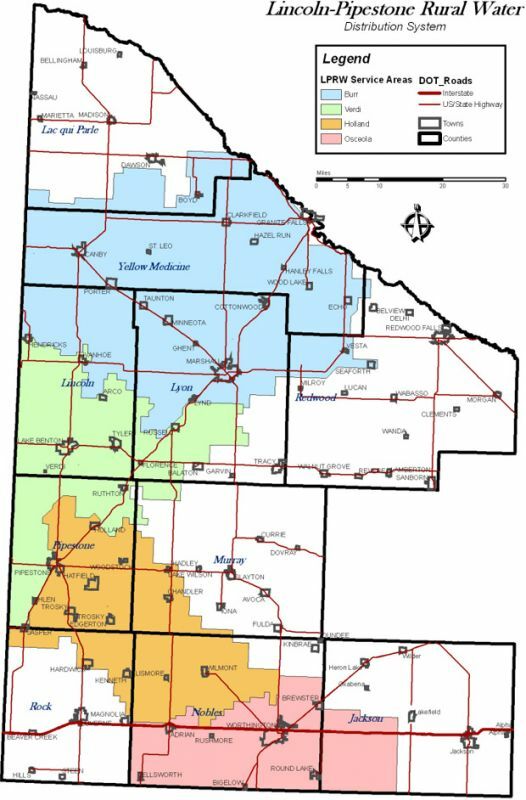 To view or download a map of Lincoln Pipestone Rural Water's Service Area, please look below. Lincoln Pipestone Rural Water is an equal opportunity provider and employer.